Stoppt die Vorratsdatenspeicherung! - Stop Surveillance Mania!" on 11 September 2010 - International Action Day "Freedom not Fear"
A broad movement of campaigners and organizations is calling on everybody to join action against excessive surveillance by governments and businesses. 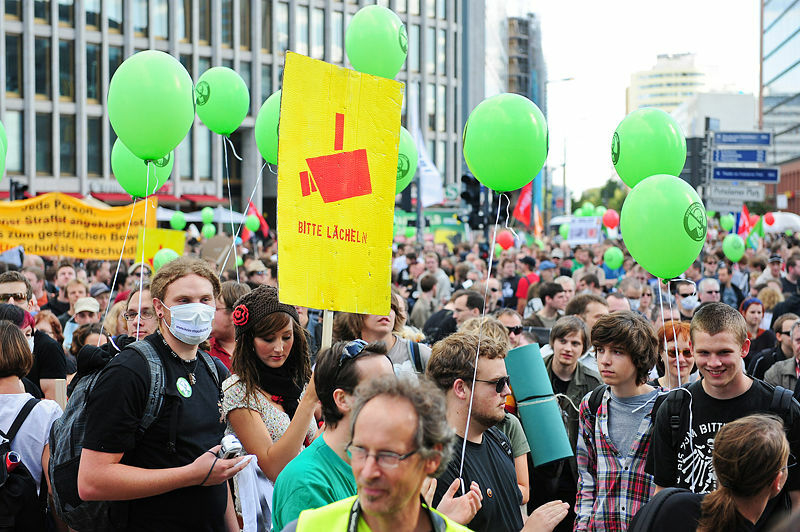 On 11 September 2010, concerned people in many countries will take to the streets, the motto being "Freedom not fear 2010 – Stop Surveillance Mania!". Civil rights campaigners are calling on everybody to join the demonstration against excessive surveillance by governments and businesses. On Saturday, 11 September 2010, we will take to the streets, under the motto “Freedom not Fear 2010 – Stop Surveillance Mania!” (“Freihit statt Angst – Stoppt den Überwachungswahn!”). The rally will start at Potsdamer Platz in Berlin at 1 p.m. (1300 CEST = 1100 GMT). It is part of the international “Freedom not Fear” action day, which will see worldwide protests against surveillance on citizens. A broad movement of campaigners and organizations has joined the call to take to the streets for civil rights, privacy and a free Internet. The German “Freiheit statt Angst” rally will take place on Saturday, 11 September 2010, as part of the international “Freedom not Fear” action day. Things have been moving in the last months. The successful outcome of a mass Constitutional Complaint against telecommunications data retention in Germany has been an unmistakable signal for freedom. Tens of thousands have taken part in a subsequent complaint against ELENA, Germany’s new central database of employment and salaries data; this complaint was submitted on 31 March. But this is just the beginning, there is still very much to do. There are no international boundaries for data. That’s why most of all, we must achieve changes internationally. The directive for data retention must now be overturned on the European level, to prevent the German data retention law from being “reformed” or reintroduced. We have just about been able to see off the German plans for Internet blocking. But European Commissioner Cecilia Malmström has restarted that debate in the EU. Sensitive data are not only being collected on behalf of national governments, but for the European Union as well. The action plan within the so-called “Stockholm programme” includes a massive extension of European security architectures, tightening of the EU’s external borders, and alarming plans to join European databases. This threatens not only the right to informational self-determination, human rights of migrants will be curtailed as well. We reject this dubious security doctrine and strive for a Europe that is free and worth living in. Civil rights continue to be eroded. It is most of all the trend to amalgamate powers of police forces, secret services and the military, as well as the “outsourcing” of sovereign powers to private companies, that cause citizen’s rights to be lost. At the workplace, in educational institutions, and in the private sphere, we are increasingly getting observed. We are being registered, monitored and checked by the state, too. Our control of our personal data is shrinking day by day. Whatever we do, with whom we speak, where we go, who our friends are, what we’re interested in – the “Big Brother” that is the state and its “little brothers and sisters” in the economy know it in more and more detail. This erosion of privacy is threatening our democratic society. People who feel constantly observed and monitored are unable to exercise their rights with confidence and courage. We want a free and open society. This can only exist if privacy, confidential communication and uncensored access to information is ensured. Privacy is an important part of human dignity, in all areas of life. That is why we are calling on everyone to take part in the mass rally in Berlin on 11 September 2010. The German “Freiheit statt Angst 2010” rally will meet on Saturday, 11 September, at 1 p.m. at Potsdamer Platz in Berlin. We are also calling on all people across the world to join the international “Freedom not Fear” action day.